The state of New York has been in the news a lot lately due to the prescription opioid and heroin epidemic that has lawmakers and law enforcement scrambling to find a solution. So far, one response has saved many lives and will save many more as the number of police officers trained to administer the anti-overdose drug naloxone increases. Ever since naloxone has been made more widely available to police officers, and in some states the public, thousands of lives have been saved. At one time naloxone was only available to paramedics and emergency room doctors, but the prescription drug crisis and the surge in heroin use has made the drug a part of everyday police work, according to the New York Times. The growing epidemic has caused the U.S. Office of National Drug Control Policy to encourage police departments to carry the life saving naloxone. 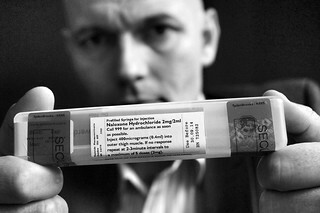 Administered by nasal spray, naloxone blocks the ability of heroin or opioid painkillers to attach to brain cells. When used, the drug essentially forces the body to withdraw from the opioid drugs and in many cases saving the user. It is clear that the America’s growing dependence and addiction to prescription opioids is here to stay. It is likely that the number of overdoses every year will continue to rise, making the need for police officers to be trained in using the medication so vital. The New York City Police Commissioner, William Bratton, stated that the city’s entire police force is being trained and will be equipped with the antidote. “Officers like it because it puts them in a lifesaving opportunity,” he said. New York is not alone, there other police forces who have begun using or preparing to use naloxone. In Quincy, Mass. every police officer is required to carry naloxone and they have reported a 95 percent success rate.